Fos lighting is always ready to make your home a ‘dream home’. Our online store for lighting accessories helps you decorate each and every corner of your home at your own convenience. We provide lighting accessories for bedroom, bathroom, ceiling, and indoor and outdoor lights. So, if you are looking for lighting accessories to beautify the ceiling of your home, then you are at right place. We help you buy spectacular and energy saver ceiling lights that will certainly adorn the view of your room. We are committed to provide you products of best quality that not only embellish your home but save your money too. 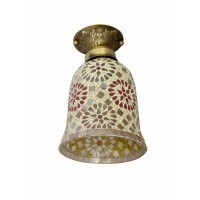 You can also buy lighting accessories for wall or a multicolored mosaic brass ceiling lamp. Or, buy golden brass ceiling light or dish antique brass ceiling light from our store. We assure you that our products will give your home a magnificent look. Our products are available in every style, color, and range. You may give your home a modern, classic, or contemporary view with our wonderful collection of lighting accessories. So, buy a magnificent lighting accessory for your home right now. Instead of visiting the showroom, buy a product of your choice from our online store. Our online store for lighting accessories- Fos lighting- has been designed to help you choose the product at your own convenience. We promise to deliver the chosen product within a few of weeks of placing the order and at the specified location. Our services are delivered across the world.